Bedding allows your brakes to reach their full potential. Until they are bedded, your brakes simply do not work as well as they can. If you've installed a big brake kit, changed your pads and rotors, or even if you've purchased a brand new car, you should set aside some time to bed the brakes in by following the instructions below. Proper bedding will improve pedal feel, reduce or eliminate brake squeal, and extend the life of your pads and rotors. For more on the theory of bedding, please refer to this excellent article by StopTech: Removing the Mystery from Brake Pad Bed-In. Caution: After installing new pads/rotors or a big brake kit, the first few applications of the brake pedal will result in almost no braking power. Gently apply the brakes a few times at low speed in order to build up some grip before blasting down the road at high speed. Otherwise, you may be in for a nasty surprise the first time you hit the brakes at 60 mph. When following these instructions, avoid doing it around other vehicles. Bedding is often best done early in the morning, when traffic is light, since other drivers will have no idea what you are up to and will respond in a variety of ways ranging from fear to curiosity to aggression. An officer of the law will probably not understand when you try to explain why you were driving erratically! Zeckhausen Racing does not endorse speeding on public roads and takes no responsibility for any injuries or tickets you may receive while following these instructions. From a speed of about 60mph, gently apply the brakes a couple of times to bring them up to operating temperature. This prevents you from thermally shocking the rotors and pads in the next steps. Make a series of eight near-stops from 60 to about 10 mph. Do it HARD by pressing on the brakes firmly, just shy of locking the wheels or engaging ABS. At the end of each slowdown, immediately accelerate back to 60mph. DO NOT COME TO A COMPLETE STOP! 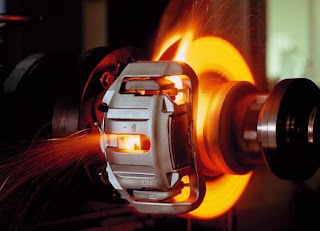 If you stop completely and sit for any length of time with your foot on the brake pedal, you will imprint pad material onto the hot rotors, which can lead to vibration, uneven braking, and could even ruin the rotors. With some less aggressive street pads, you may need fewer than eight near-stops. If your pedal gets soft or you feel the brakes going away, then you've done enough. Proceed to the next step. The brakes may begin to fade slightly after the 7th or 8th near-stop. This fade will stabilize, but not completely go away until the brakes have fully cooled. A strong smell from the brakes, and even smoke, is normal. After the 8th near-stop, accelerate back up to speed and cruise for a while, using the brakes as little as possible. The brakes need 5 to 10 minutes to cool down. Try not to become trapped in traffic or come to a complete stop while the brakes are still hot. If club race pads, such as Hawk Blue, are being used, add four near-stops from 80 to 10mph. If full race pads, such as Performance Friction 01 or Hawk HT 14, are being used, add four near-stops from 100 to 10 mph. After the break-in cycle, there should be a slight blue tint and a light gray film on the rotor face. The blue tint tells you the rotor has reached break-in temperature and the gray film is pad material starting to transfer onto the rotor face. This is what you are looking for. The best braking occurs when there is an even layer of of pad material deposited across the face of the rotors. This minimizes squealing, increases braking torque, and maximizes pad and rotor life. After the first break in cycle shown above, the brakes may still not be fully broken in. A second bed-in cycle, AFTER the brakes have cooled down fully from the first cycle, may be necessary before the brakes really start to perform well. This is especially true if you have installed new pads on old rotors. If you've just installed a big brake kit, the pedal travel may not feel as firm as you expected. After the second cycle, the pedal will become noticeably firmer. If necessary, bleed the brakes to improve pedal firmness.